The only book on the creation of the blockbuster movie&#151;a fabulous visual companion to the final chapter in the X-Men motion picture trilogy from 20th Century Fox. This lavishly illustrated filmbook boasts more than 360 illustrations, including striking movie stills and unique set designs, concept drawings, costume sketches, and storyboards, appearing exclusively in this edition. Beginning with an introduction by director Brett Ratner, text includes commentary about the production of the movie, along with an original history of the X-Men by Peter Sanderson, the comics historian and author of X-Men: The Ultimate Guide, illustrated with archival Marvel comic-book art. In X-Men: The Last Stand, a "cure" for mutancy threatens to alter the course of history. For the first time, mutants have a choice: retain their uniqueness, though it isolates and alienates them, or give up their powers and become human. The opposing viewpoints of mutant leaders Charles Xavier (Patrick Stewart), who preaches tolerance, and Magneto (Ian McKellen), who believes in the survival of the fittest, are put to the ultimate test&#151;triggering the war to end all wars. The old cast returns, including Hugh Jackman as Wolverine and Halle Berry as Storm, along with newcomers Kelsey Grammer as Beast, Vinnie Jones as Juggernaut, and Ben Foster as Angel. 360 photos and illustrations. 5.0 颗星，最多 5 颗星An appreciation of the art in an irresistible superheroic fantasy of the film itself in filmmaking for aficionados of genre! 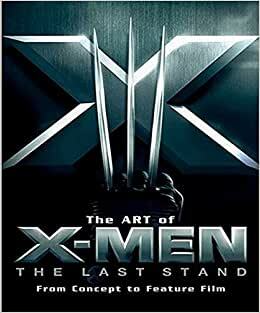 The Art of X-Men The Last Stand, is definitely a glitzy and lush movie companion book to the hit movie from movie stills to conceptual designs of inside the movie. This book has almost four hundred illustrations from movie stills to production artwork, that's absolutely sensational, concept drawings that are eye popping imagination and ideas abound in this book and movie. This is not a book solely for fantasy superhero buffs but instead is more for aficionados of the superheroic genre that will no doubt find it an irresistible heroic fantasy to watch and enjoy as a moviegoing experenice. Commentary is provided by director Brett Ratner commenting about the film's production,in it and lot review on it. This is the only book on the market on the creation of the blockbuster movie, an absolute essential visual companion to the final chapter in the X-Men motion picture trilogy saga.That will no doubt dazzle it's audience of it's striking visual movie stills and set designs, of concept drawings, and costume sketches of it's storyboards. The book albeit to say has scanty information on the subject but none the less does draw on the original history of the X-Men, illustrated with archival comic book art. The characters portray their comic book counterpart exceptionally well. I had slight reservation in Colossus he could have been a little larger none the less an excellent portrayal. Wolverine played by Hugh Jackman is the incarnation of the character his perfect portrayal of Wolverine is indisputable. Patrick Stewart another great actor who fits into his role Professor X like a glove. Beast who is absolutely magnificent is played by Kelsey Grammer. The entire cast are perfect each actor sliding into their respective roles perfectly doing the character total justice. The movie details the movie where a cure for mutancy threatens to alter the course of history. For the first time, mutants have a choice, change become normal or remain alienated but individually perfect as they are. The entire movie revolves around this dilemma, triggering the war to end all wars. This is the first film in the series to feature the original line up of the X-Men from the comics, Professor X, Cyclops, Jean Grey ( originally she played Marvel Girl, not Phoenix), Iceman, Beast(his character appeared briefly minus blue fur), Angel. Most of the rest of the major characters joined the team in X-Men#1, Storm, Wolverine, Colossus and Nightcrawler and so on. While many complained of the quality of the third X-Men film, this book also suffers from the same problems. It's glitzy with lush movie stills and conceptual designs, but somehow feels just like an empty sugarcoated endeavor. While the Art of X2 book features more systematic layouts and narratives, this one is more splashed together from eycandies. Don't get me wrong, it's still enjoyable, but I feel that I've seen this kind of effort somewhere elase before. I found this very close to the art book about the previous chapter: unbalanced. Too few storyboards and conceptual art/visual fx pictures and maybe too many movie stills.....but it's only a personal opinion..... I prefer when an "Art of" is fully focused into storyboards (Art of Matrix) or into comparison between creating what is in comic books and comic books themselves (Art of Sin City). Among the media tie-in items for X-Men the Last Stand, there are few things better for die hard fans than The Art of X-Men The Last Stand from Newmarket Press. This is a gorgeous 160 page soft cover book featuring hundreds of photos, concept drawings, sculptures, and storyboards from the latest hit film. The presentation if first rate in its delivery. The first chapter of the book traces the long and often bumpy history of the X-Men, first created in 1963 by Stan Lee and Jack Kirby at Marvel Comics. While the X-Men has been the most popular comic in the world for the better part of 25 years, it certainly didn't start out that way. The X-Men basically treaded water throughout the 60's and early 70's, with the notable exceptions of the brief runs by artistic greats Neal Adams, Jim Steranko, and Barry Smith. In fact things got so bad for the title that eventually new stories ceased and it just ran re-prints for a time. Then, 1975 brought us Giant-Sized X-Men #1 by writer Len Wein and artist Dave Cockrum. This book would feature a whole new cast of X-Men such as Wolverine, Storm, Colossus, Banshee, Nightcrawler, Thunderbird, and Sunfire. The New X-Men were born and the rest is history. This chapter introduces to both the new and old X-men team members as well as their many villains such as Magneto and the Brotherhood of Evil Mutants. The next chapter gets into the latest film and features outstanding full color photography from the film, but that's just the beginning. There's magnificent concept art done for various characters and scenes from the film. You can see the various artists renderings for Colossus, The Beast, the Danger Room, and Phoenix, and compare them to the finished products. Chapters three and four highlight the various members of the Brotherhood such as Mystique, Pyro, and Juggernaut, as well as various action scenes. There were over a half dozen different looks to Juggernaut's signature headgear, some of which are really better than the one they ultimately chose for the film. There are some great storyboard sequences in this chapter such as when Magneto brings down the Golden Gate bridge, Pyro battles Iceman, and Kitty Pryde flees from Juggernaut as he literally smashes through walls in pursuit of his prey. These photos, drawings, and storyboards truly get you inside the film and give the fan a greater understanding of the filmmaking process. You get a keen sense of just how meticulous they are in planning out shots and film sequences. It's a fantastic book from beginning to end. If you're an X-Men fan than you MUST own this book!